Bay Area Kick-off Meeting to Shut Down New York City to Stop Police Murder! One after another -- and so many others, precious Black and Brown lives – victims of police murder. We think of their faces, and furiously ache for justice. Over 1000 people a year killed by police – yet since 2005, less than 60 indictments, less than 25 convictions! Millions languish in prison, generation after generation, Black and Latino brothers and sisters. The spear point of a whole matrix of oppression. NO! THESE MURDERS BY POLICE MUST STOP - NOW!! 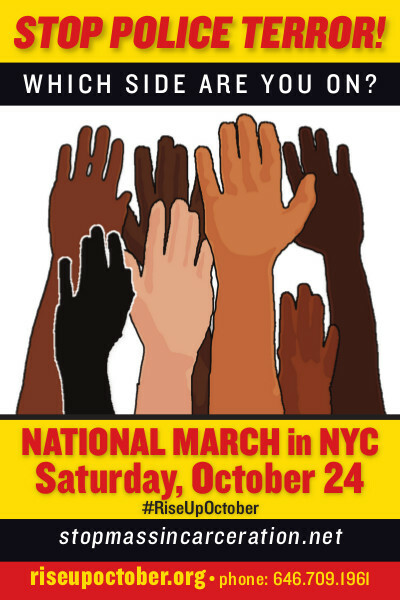 This demonstration will be resistance-based, uncompromising in spirit and, at the same time, pluralistic and diverse, involving hundreds of thousands of people, reaching into every corner of this society and powerfully impacting the whole world. History has shown that no significant change has been won without mass determined resistance.